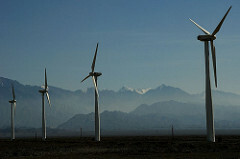 How Serious Is China's Clean-energy Push? Since the Bonn climate talks are in the news, and much of the focus has been on China, it's worth looking at the country more closely. The conventional view is that China's an out-of-control pollution monster, building two dirty coal-fired plants each week, capable of single-handedly finishing off the planet with its fast-growing greenhouse-gas emissions. That's all true, but there's another side here: China's also taking breathtakingly large steps on the clean-energy front—at least on paper. Over at the Center for American Progress, Julian Wong and Andrew Light tally up the recent developments. China spent $12 billion on renewable power in 2007—second only to Germany—and is planning to spend some $223 billion (not a typo) on new clean-energy development in the next decade. That's in addition to bolstering efficiency and setting goals to reduce the amount of carbon per unit of GDP. Chinese officials are also drafting new fuel-economy standards even stricter than those just outlined by the Obama administration, and the country has been slapping a large, 40 percent excise tax on SUVs and other gas-guzzling cars. Not to mention the country's spending some $1 trillion between now and 2020 upgrading its railway network, and is planning to produce some 500,000 hybrid cars and buses by 2011. In any case, none of this negates all those dirty coal plants cropping up, which still supply three-fourths of the country's electricity. China is still the world's biggest emitter of greenhouse gases, and those emissions are climbing rapidly upward. Also, while Beijing may be issuing plenty of eco-friendly laws, they don't always get enforced in the provinces—see this old TNR piece for more on that. But the larger point is that China's central government does take this climate problem quite seriously—they've arguably taken stronger action than the United States thus far (that would change if the Waxman-Markey climate bill was signed into law). Still, that won't make international talks easy. Earlier today, U.S. envoy Todd Stern* said of countries like China: "They’re doing a lot already, but they’re going to need to do more actions and commit to them and be able to quantify them." As mentioned below, it's doubtful that developing countries like China and India will agree to mandatory reductions in the next decade, but they can agree to formalize some of what they're already doing and meaningfully slow the growth of their emissions, which would be a major step in itself, and a contentious one.